The Armed Forces Families Foundation and the USO of North Carolina cut the ribbon for the opening of USO of North Carolina’s brand new center at the Raleigh Military Entrance Processing Station (MEPS), further demonstrating their commitment to serving military service members and their families. The Armed Forces Families Foundation contributed a total of $16,801 to not only support the MEPS center, but also fund upgrades to the USO of North Carolina’s center inside the Raleigh-Durham International Airport. Over $9,000 of the funds were used to completely furnish a new USO of North Carolina facility located within the Raleigh MEPS facility. The new furnishings include a couch, storage cabinets, a buffet area and refrigerator, designated children’s area, artwork, carpet, tables and more. 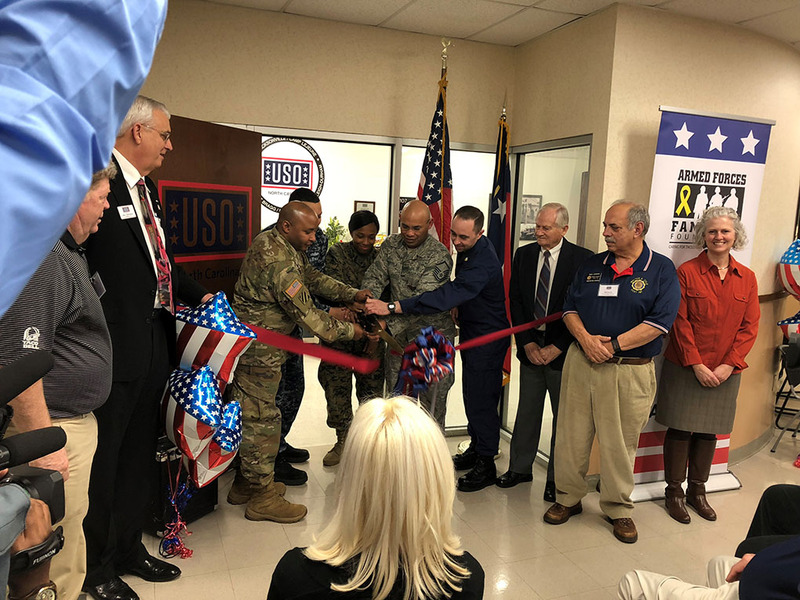 The remaining funds were used for carpet and tile refurbishment and facility seating at the USO of North Carolina RDU Center, which serves approximately 5,000 service members and their families monthly. The USO of North Carolina strengthens our nation’s service members from the moment they enter the military through their transition to civilian life. If you’d like to volunteer with USO of NC or learn more, please visit https://northcarolina.uso.org/.